Yoga is widely practiced for its health benefits (Alter, 2004; Singleton, 2010), especially for chronic non-communicable diseases (Holte and Millis, 2013). The Consortium of Academic Health Centers for Integrative Medicine located at Michigan, U.S. teaches yoga in most of its branches (Holte and Millis, 2013; https://imconsortium.org/)1. Yoga is one of the top ten complementary health practices used by adults in the U.S. where 45 percent of this population have at least one chronic illness (Wu and Green, 2000). Two meta-analyses were carried out to examine yoga in the context of stroke (Lawrence et al., 2017; Thayabaranathan et al., 2017). The authors of the meta-analyses concluded that yoga is effective but did not report any adverse event associated with yoga practice (Lawrence et al., 2017; Thayabaranathan et al., 2017). Despite this, safety is important during stroke rehabilitation, especially for practices which involve maintaining balance. Similarly, we found that in meta-analyses of yoga used for multiple sclerosis or cardiac disease there was a lack of information related to the safety of yoga interventions as adverse events related to yoga practice were not usually mentioned (Cramer et al., 2014, 2015a). Apart from this, when safety related data were reported there were no adverse events (Cramer et al., 2014, 2015b). Safety issues in yoga practice apply to all chronic illnesses. An ancient Hatha yoga text gives importance to the method of practice, stating “….by the proper practice of pranayama (voluntarily regulated yoga breathing), all diseases are eradicated, whereas through the improper practice all diseases can arise” (Hatha Yoga Pradipika, Circa 1500 A.D., Chapter II Verse 16; Muktibodhananda, 1998). William Broad (2012) attempted to highlight the adverse events which could occur with yoga practice in his book “The Science of Yoga: The Risks and Rewards” (Broad, 2012). This evoked a wide range of responses, especially from those who have benefitted from yoga practice. However the adverse events related to yoga cannot be discounted. Hence this opinion article has two aims. (i) The first aim is to cite published examples of adverse events occurring from yoga practice due to: (a) an unusually long duration of yoga practice, (b) practice of a yoga technique more frequently than is recommended, (c) excess strain on a specific joint during yoga practice, or (d) ignoring any health condition which would be a contraindication for yoga practice. (ii) The second aim is to suggest recommendations to improve safety and reduce adverse events related to yoga practice as therapy. The search strategy was carried out in two stages. (i) The authors identified common reasons which could lead to an adverse event due to yoga practice, based on (a) the authors' experience with yoga practitioners and (b) their awareness of adverse events resulting from yoga reported by conventionally trained medical practitioners. This information was in the form of oral reports from 1997 to 2018. The most common reasons for adverse events were (a) practicing yoga for an extra duration, (b) practicing yoga more frequently than is recommended, (c) excess strain on a specific joint during yoga practice and (d) adverse event related to a prior health condition. (ii) Two researchers independently searched PubMed abstracts from 1970 to 2018 for examples to demonstrate the four points mentioned above. Four examples were selected as the most appropriate and are described in the manuscript. A 22 year old male, healthy college student who practiced the diamond pose (vajrasana, in Sanskrit) for 6 h a day for 2 months reported an abnormal gait due to foot drop (Chusid, 1971). The student had 18 months of experience in yoga. The subject recovered from foot drop after 9 weeks of discontinuing the posture. Practicing a yoga posture for 6 h a day is unusual; the recommended duration is 5–10 min for a beginner and not more than 30 min for an experienced practitioner (The divine life society2, http://yogaindepth.blogspot.com/p/detailed-description-of-yoga-asanas.html)3. In this case foot drop could be considered a consequence of practicing a yoga posture for a longer duration than is recommended. In certain cases it may not be the duration but the frequency of the practice which was excessive. Regurgitative cleansing (kunjal-kriya in Sanskrit) involves voluntarily induced vomiting after drinking saline water on an “empty stomach” upto a point where the practitioner feels the urge to vomit (Saraswati, 2012). This yoga cleansing technique resulted in dental erosion in a 38 year old male who had practiced the technique every morning for 12 years (Meshramkar et al., 2007). While an ancient Hatha Yoga text describes kunjal kriya as useful to reduce digestive disorders, it is stated that the practice should be done once a week under the supervision of an experienced yoga teacher (Saraswati, 2012). Endogenous gastric acid enters the oral cavity during vomiting (José et al., 2008). The pH of gastric acid is approximately 1.2, which is below the critical value for demineralization of the teeth (José et al., 2008). This may explain the dental erosion in the 38 year old male in the study cited above, where a yoga technique was practiced more frequently than is recommended. Another factor which could be responsible for the adverse events following yoga practice include techniques which could either strain a joint or makes it unstable (Nagura et al., 2002). A cross-sectional study conducted in southern Thailand included 576 persons (276 females; 40 years or older) without any rheumatic diseases (Tangtrakulwanich et al., 2007). The aim was to correlate radiographic knee osteoarthritis with the habit of sitting on the floor for various activities, in sitting postures which resembled yoga postures as mentioned below. Those participants who reported squatting (similar to the chair pose or uttakatasana), side-knee bending (similar to the hero pose or veerasana), the lotus pose (padmasana) and total life time floor activities in highest tertile, showed a two time increased risk of osteoarthritis of the knee compared to those in the lowest tertile of exposure to floor seated activities (Tangtrakulwanich et al., 2007). These postures involve extreme flexion of the knee which causes excessively large contact stress on the knee joint (Dahlkvist et al., 1982; Nagura et al., 2002), which in turn causes cartilage damage and also acts as a precursor for degenerative diseases of the joint. Whether squatting is indeed harmful definitely needs thorough investigation, however the report cited above suggests the necessity for such studies and for precautions during yoga practice. Another factor which could result in ill effects of yoga practice is an existing condition which may predispose the practitioner to deformity or illness (Cramer et al., 2013). A case study reported that sitting in the lotus pose during a meditation session resulted in a spontaneous supracondylar femoral fracture in a 58 year old Buddhist monk who was human immunodeficiency virus (HIV) positive (Pinto Neto et al., 2011). Patients with the HIV virus have compromised bone density due to the use of antiretroviral therapies which are associated with bone loss and fractures (Puthanakit et al., 2012). The lotus pose exerts stress on the supracondylar femur through upward force from the ankles and downward force from the knees. Stress on the compromised femur of the patient who was HIV positive could have caused the supracondylar fracture. This case report shows the importance of knowing if a person practicing yoga has any health condition which could make it dangerous for them to practice specific yoga techniques. In contrast to the above mentioned reports on the adverse events associated with specific yoga practices there are a large number of studies on the benefits of yoga practice to improve physical and mental health (Hagen and Nayar, 2014; Jeter et al., 2015). Most of the studies which were conducted to assess the efficacy of yoga practice did not identify or report adverse events in the trials (Cramer et al., 2015b) In the meta-analyses of yoga used for stroke, multiple sclerosis and cardiac disease there was a lack of information about the safety of yoga practice, as adverse events were not usually mentioned (Cramer et al., 2014, 2015a; Lawrence et al., 2017; Thayabaranathan et al., 2017). This may be due to the fact that in such studies the yoga interventions were designed and delivered under the supervision of experienced yoga teachers (Cramer et al., 2015b) whereas in the four studies mentioned above on the adverse effects associated with yoga practice the subjects were either (i) practicing the yoga technique incorrectly, (ii) having precondition(s) related to the reported adverse effect, or (iii) were not aware that the particular yoga technique they were performing could worsen the precondition that they had. It could also be that adverse events were not reported or noted by the yoga teachers as they were not trained to do so. Ancient Hatha yoga texts emphasize that yoga practices should be performed under the supervision of an able teacher stating “one should practice yoga as instructed by his guru” (gurupadiūha-mārgheṇa yoghameva samabhyaset, in Sanskrit; Hatha Yoga Pradipika, Circa 1500 A.D., Chapter I, Verse 14; Muktibodhananda, 1998). Hence though there is an increase in the number of studies reporting the efficacy of yoga to improve physical and mental health, the practice should be done with caution and under the supervision of an experienced yoga teacher. There are known organizations to train yoga teachers and give them guidelines in different parts of the world. Examples are cited here from India, the U.S. and Australia. This is not all-inclusive as (i) there may be other organizations in India, U.S. and Australia and (ii) other countries also have similar organizations. Hence this is a non-representative description. In India there are three main institutions which give guidelines for yoga practice. These are (i) the Morarji Desai National Institute of Yoga4 started in 1976 as the Central Research Institute of Yoga which continued as MDNIY from 1988, (ii) the Central Council for Research in Yoga and Naturopathy (Central Council for Research in Yoga & Naturopathy, www.ccryn.gov.in)5 and (iii) the Indian Yoga Association (Indian Yoga Association, http://www.yogaiya.in/about/)6. The CCRYN and the IYA were established in 1978 and 2008, respectively. The MDNIY and CCRYN are non-profit organizations funded by the Ministry of AYUSH, Government of India while the IYA is a non-profit, self-regulatory body approved by the Ministry of AYUSH and the Ministry of Health and Family Welfare, Government of India. The three organizations have no specific guidelines for reporting adverse events which occur during yoga practice. In the U.S. there are the International Association of Yoga Therapists (IAYT, https://yogatherapy.health/about-iayt/)7 and Yoga Alliance (www.yogaalliance.org)8 which provide guidelines about teaching yoga. IAYT was established in 1989 while Yoga Alliance was started in 1997. The institutions are not-for-profit organizations which prepare national standards for training of yoga teachers in the United States and support research and education related to yoga as a therapy. These organizations do not have guidelines for adverse event reporting related to yoga practice. Also the National Center for Complementary and Integrative Health (Briggs, 2013) has mentioned safety concerns in yoga practice but there are no suggestions about reporting of adverse events due to yoga. In Australia, the Australasian Association of Yoga Therapists (www.yogatherapy.org.au/)9 and Yoga Australia (www.yogaaustralia.org.au)10 are two associations which provide guidelines for yoga teachers and those who use yoga therapy. The associations were established in 1991 and 1999 respectively. They are not-for-profit organizations which were founded to bring yoga teachers from different traditions together and establish yoga therapy as a recognized, professional mode of treatment. Both these associations have no specific guidelines for reporting adverse events due to yoga practice. It is recommended that (a) the duration and frequency of yoga practice, (b) the amount of strain on a specific joint during yoga practice, and (c) prior health conditions should be taken into account before starting yoga, to minimize adverse events associated with yoga practice. At various levels care should be taken to ensure that yoga practice is safe and to reduce the chance of adverse events. 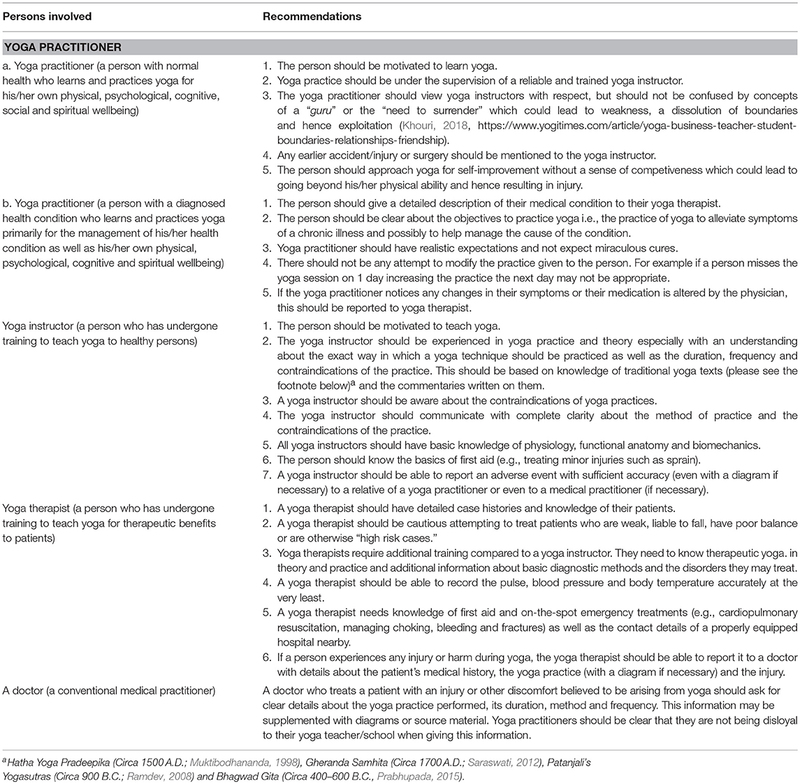 The recommendations for the safe use of yoga at different levels have been summarized in Table 1. Table 1. Recommendations for safe use of yoga at different levels. There appears to be no organization responsible to record adverse events related to yoga. Hence an existing organization should take the initiative by having a centralized mechanism to report and track adverse events in a standard way. Organizations within a country and in different countries should come to a consensus so that this information is reported uniformly. This would be useful for yoga practitioners, yoga instructors and yoga therapists. It would also act as a resource for teaching and even to form policies. ST compiled the manuscript. SS and NK assisted in compilation of the manuscript. AB assisted in compilation of the manuscript and provided the infrastructure. The study received institutional funding from Patanjali Research Foundation Trust. Funding by Patanjali Research Foundation (Trust) is gratefully acknowledged. 4. ^Morarji Desai National Institute of Yoga [Internet]. Morarji Desai National Institute of Yoga: An Autonomous Organization Under Ministry of AYUSH Government of India. Available online at: http://www.yogamdniy.nic.in/ (accessed February 15, 2019). Alter, J. (2004). Yoga in Modern India: The Body Between Science and Philosophy. Princeton, NJ: Oxford University Press. Briggs, J. (2013). The Safety of Yoga. Available online at: https://nccih.nih.gov/research/blog/safeyoga (accessed March 19, 2019). Broad, W. J. (2012). The Science of Yoga: The Risks and the Rewards. New York, NY: Simon and Schuster. Dahlkvist, N. J., Mayo, P., and Seedhom, B. B. (1982). Force during squatting and rising from a deep flexion. N. Engl. J. Med. 11, 69–76. Holte, A., and Millis, P. J. (2013). “Yoga and chronic illness,” in Chronic Illness, Spirituality, and Healing, eds M. J. Stoltzfus, R. Green, and D. Schumn (New York, NY: Palgrave Macmillan), 141–163. Khouri, H. (2018). Setting Boundaries Between Yoga Teachers and Students. Available online at: https://www.yogitimes.com/article/yoga-business-teacher-student-boundaries-relationships-friendship (accessed August 27, 2018). Muktibodhananda, S. (1998). Hatha Yoga Pradipika, 3rd Edn. Munger: Yoga Publications Trust. Prabhupada, A. C. B. S. (2015). Bhagvad Gita As it Is. Mumbai: Bhaktivedanta Book Trust. Ramdev, S. (2008). Maharshi Patanjali's Yogadarshana (The Yoga Philosophy). Haridwar: Divya Prakashan. Saraswati, S. N. (2012). Gheranda Samhita, 1st Edn. Munger: Yoga Publications Trust. Wu, S. Y., and Green, A. (2000). Projection of Chronic Illness Prevalance and Cost Inflation. Santa Monica, CA: RAND Health. Copyright © 2019 Telles, Sharma, Kala and Balkrishna. This is an open-access article distributed under the terms of the Creative Commons Attribution License (CC BY). The use, distribution or reproduction in other forums is permitted, provided the original author(s) and the copyright owner(s) are credited and that the original publication in this journal is cited, in accordance with accepted academic practice. No use, distribution or reproduction is permitted which does not comply with these terms.